The Ricoh GX200 is virtually identical to the older GX100 in terms of its design, so a lot of the comments that we made in our review of that camera will be repeated here. You'd be hard-pressed to tell the GX200 and GX100 apart if you put them side by side - perhaps the most prominent difference is the removal of the "Caplio" branding, which Ricoh have decided makes their cameras sound more professional. The Ricoh GX200 is a wide and fairly slim compact digital camera that just about fits into the palm of my average sized hands, measuring 111.6 mm (W) x 58.0 mm (H) x 25.0 mm (D) and weighing slightly less than the GX100 at around 210g. Utilising an aluminium alloy body, it's exceedingly well built, certainly on a par with the GR Digital II sister model and easily up there with the best that the other manufacturers have to offer. It has an under-stated, all-black appearance, and together with the slightly heavier weight this lends the camera a professional feel. Despite its small dimensions, the Ricoh GX200 has a chunky rubberized handgrip that allows you to get a good grip, and there's a small area of the same material acting as a thumb rest on the rear of the body. The all-metal, central tripod mount is the final giveaway sign that this is intended to be a serious camera (most compacts have a plastic mount squeezed into one of the corners). 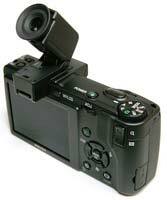 The GX200 features the same 24-72mm, f2.5(W)-4.4(T), 3x wide-angle optical zoom lens as the GX100. There has been a welcome recent trend to widen the usual standard zoom lens on compacts from 35mm or more to 28mm, with Panasonic in particular leading the way. Ricoh have taken things one step further, offering a fairly bright 24mm focal length that really opens up the possibilities for subjects like landscapes and urban environments. The Ricoh GX200's 72mm telephoto length will still be adequate for head and shoulders portrait shots, but the aperture of f/4.4 isn't very bright for such a short focal setting. Still, street and landscape photographers will love the true wide-angle setting, especially when they discover that Ricoh also offer the optional DW-6 wide conversion lens which provides an even wider 19mm focal length! Ricoh have also just announced the new TC-1 telephoto conversion lens, which provides a much longer focal length of 135mm. Note that vignetting will occur if the zoom is not set to full telephoto when the TC-1 convertor is attached. Ricoh have even announced an innovative new lens cap, the LC-1, which opens and closes automatically in sync with the lens movement. As a nod to its film predecessors, the GX200 has a Step Zoom option that fixes the lens' focal length at 24/28/35/50 and 72mm, emulating the prime lenses that many photographers are used to. The Ricoh GX200 now offers more megapixels, featuring a 12 megapixel, 1/1.7-inch CCD sensor which Ricoh are promoting as an improvement, but which many photographers may not welcome due to the increased risk of noise and artifacts. To counter this, Ricoh claim that their new Smooth Imaging Engine III processing engine offers better noise reduction - you can see the results for yourself on the Image Quality and Sample Images pages. Perhaps more important than the megapixel count are the image formats that are on offer. There's the usual choice of Fine and Normal quality JPEGs, but Ricoh have wisely continued to provide a RAW mode setting, which is significant because only a relatively tiny number of compacts offer this mode. Even better, the RAW format that they have chosen is not a proprietary one, but Adobe's DNG format, which means that the Ricoh GX200's files are instantly available in any RAW software that supports DNG (virtually every one). You can edit the GX200's RAW files in your favourite RAW convertor from day one, so it's an excellent decision by Ricoh that will really appeal to the pro photographer. There are two significant new additions to the GX200's RAW mode. You can now use the bracketing function to automatically change the exposure settings when shooting in RAW mode, useful for HDR photography, and there's a retro 1:1 aspect ratio for square format photos, a feature borrowed from the GR Digital II. Unlike the Ricoh R8 camera that we recently reviewed, the GX200 uses an up/down rocker switch on the back of the camera for zooming the 24-72mm lens. This isn't quite as intuitive as the pull/push lever on top of the R8, but Ricoh can perhaps be forgiven because the reason for this difference is the three external controls which form the creative heart of the GX200. Located on the top right of the camera are the Mode dial and what Ricoh refer to as the Up-down dial, and on the back is the Adj. button. These controls allow you to choose which shooting mode you want to use, with a choice of full auto, program shift, aperture-priority, shutter-priority and fully manual, and to control the settings of the particular mode that you have picked. For example, in Manual mode, the Up-down dial sets the aperture and the Adj. button sets the shutter speed, providing quick and intuitive access. Furthermore, pressing the Adj. button now allows you to quickly adjust 5 different settings that are commonly used (up from 4 settings on the GX100) - Exposure Compensation, White Balance, ISO Speed, Quality and AE/AF Target Shift. Even better, the Adj. menu is customisable - you can choose what the first four settings do, allowing you to control exactly what you want quick access to (the fifth option, AE/AF Target Shift, can't be changed). Continuing the customisation theme, you can configure the GX200 and save the current settings as one of three My Settings modes (the GX100 offered two My Settings modes), which are accessible by setting the Mode dial to either the MY1, MY2 or MY3 option. This allows you to configure the GX200 for three different uses and allows quick access to each configuration (the camera remembers the settings when it's turned off). Finally, there are now two Function (Fn) buttons, one on the top-left of the camera and one on the left button of the navigation pad, both of which can also be customised. By default FN1 toggles between auto and manual focus and FN2 turns AE Lock on and off, but they can be changed to control one of 16 other settings. The Ricoh GX200 is easily the most customisable digital compact camera that we've ever reviewed. 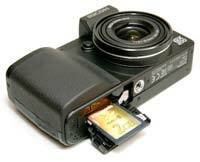 As the Ricoh GX200 offers a full range of advanced exposure controls, it's quite complex in terms of its design. There are 17 external controls in total, leaving just enough room for the new, slightly larger 2.7 inch LCD screen on the back of the camera. 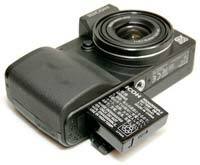 The Ricoh GX200 offers a comprehensive range of focusing and metering modes that should cover most situations. On the focusing side, the multi AF system has 9 separate auto focus areas, and there's also Spot AF, Manual Focus, Snap (focuses at 2.5m) and Infinity (useful for landscapes). The AF target shift function, which on the GX100 could only be used in macro shooting, is now also available in any of the normal shooting modes, allowing you to shift the target for AF or AE or both without having to move the camera. In terms of metering, the multi metering mode is 256 segment, and there's also center weighted average metering and spot metering. The electronic leveler is a brand new addition to the GX200, a feature borrowed from the GR Digital II. This helps to ensure level shots while viewing through the LCD monitor, both in landscape and portrait mode. You can view the horizontal indicator on the LCD monitor to ensure that shots are aligned horizontally. If you're using the external viewfinder, or can't see the LCD screen in very bright sunlight, then the camera can also be set to make a sound to indicate a level horizon. It doesn't sound like a big deal in theory, but in practice it really helps to make all those wide-angle shots perfectly level. The GX200 features a sensor-based anti-shake system called Camera Shake Correction. Turn it on and the Ricoh GX200 automatically compensates for camera shake, which is a slight blurring of the image that typically occurs at slow shutter speeds. You don't notice that the camera is actually doing anything different when anti-shake is turned on, just that you can use slower shutter speeds than normal and still take sharp photos. Ricoh seem to have realised the importance of this system, as it is turned on by default in the menu system. You can see some example of the Camera Shake Correction system in action on the Image Quality page. Thankfully leaving the anti-shake system on didn't negatively affect the battery-life, with the camera managing over 350 shots before the battery needed to be recharged. Note that Camera Shake Correction is automatically turned off in multi-shot or manual mode when the shutter speed is 1 second or greater, and it doesn't work at all in movie mode. The flash functions on the GX200 have been greatly improved. The light intensity of the built-in pop-up flash can be adjusted via the Flash Exposure Compensation setting (-2.0 EV to +2.0 EV), and the Manual Flash Amount function allows you to set the intensity of the Manual flash mode, with a range of options from Full to 1/32 of the maximum power. The flash timing can now be synchronised as either 1st Curtain (after the exposure starts) or 2nd Curtain (before the exposure starts), allowing for more creative effects than on the GX100. The Ricoh GX200 has a much improved, 2.7 inch, 460,000 pixel LCD screen, with double the amount of pixels that the GX100 and most digital compacts have. This high-resolution screen coped admirably with the majority of lighting conditions and is a great improvement on the GX100's, even being nice to use in low-light. If you just don't get on with LCD screens, there's also the optional, completely removable electronic viewfinder (EVF), which offers 100% field of view and dioptre adjustment for glasses wearers. Sold as part of the GX100 VF Kit (costing an additional �50 in the UK), the VF-1 viewfinder slots into the hot-shoe on top of the body, allowing you to hold it up to your eye and instantly giving the GX100 the feel of an SLR camera. Even better, the EVF has a tilt mechanism with 90 degrees of movement, so that you can effectively use it as a waist level viewfinder. Finally, all of the shooting information is displayed in the same manner as on the LCD monitor, so you can use the GX200 without using the LCD screen if you wish. On the downside, you obviously can't use an external flashgun at the same time as the EVF, and you can't use the built-in pop-up flash when the EVF is tilted. Thankfully it's one of the better quality EVF that I've ever used, and in a world where true optical viewfinders are few and far between, it's definitely a welcome addition and one that I'd strongly recommend choosing if you decide that the GX200 is the camera for you. The main menu system on the Ricoh GX200 is straight-forward to use and is accessed by pressing the Menu button in the middle of the navigation pad. There are two main menus, Shooting and Setup. Quite a lot of the camera's main options, such as image size, sharpness, metering mode and continuous mode, are accessed here, so the Shooting menu has 16 options spread over 4 screens, and the Setup menu 30 options over 5 screens. Due to the large LCD screen and restricting the number of on-screen choices to 6, the various options and icons are clear and legible. If you have never used a digital camera before, or you're upgrading from a more basic model, reading the comprehensive and easy-to-follow 266 page manual before you start is a must. Thankfully Ricoh have chosen to supply it in printed format, rather than as a PDF on a CD, so you can also carry it with you for easy reference in the field. Ricoh are well known for delivering responsive cameras, and the GX200 certainly continues that tradition. The start-up time from turning the Ricoh GX200 on to being ready to take a photo is very quick at around 0.75 second, and it takes just over 1 second to zoom from the widest focal length to the longest. Focusing is very quick in good light when half-pressing the shutter button, and the camera happily achieves focus most of the time indoors or in low-light situations. The GX200 also consistently and quickly focuses with a full-press of the shutter button, taking about 1/2 second to capture the image. It takes about 0.5 second to store a full-sized JPEG image, allowing you to keep shooting as they are being recorded onto the memory card - there is a very brief LCD blackout between each image. 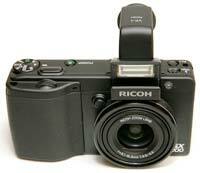 Ricoh have greatly improved the RAW performance of the GX200. On the older GX100 model, it took around 6 seconds to store a single RAW image, during which you can't take another shot. On the GX200, shooting a single RAW image is no different to a JPEG, with exactly the same processing times. In the fastest Continuous mode the camera takes 1.18 frames per second for an unlimited number of images at the highest JPEG image quality, which is about average for this class of camera. The GX100 didn't offer a Continuous option when shooting in RAW mode because of the 6 second storing time - the GX200 can now shoot a maximum of 5 RAW images at 1.18fps before the camera locks-up and writes the data, which takes about 10 seconds, a significant improvement. Overall the Ricoh GX200 is very quick in terms of operational speed when shooting JPEGs, and remarkably nearly as quick for RAW files too. Once you have captured a photo, the Ricoh GX200 has an above average range of options when it comes to playing, reviewing and managing your images. You can instantly scroll through the images that you have taken, view thumbnails (up to 20 on-screen at once), and zoom in and out up to 16x magnification. You can watch slideshows with audio, set the print order, delete, protect and resize an image, and copy an image from internal memory onto a memory card. Skew correction makes an image shot at an angle look more square, while the new Level Compensation and White Balance Compensation options allow you to correct the brightness/contrast and white balance in-camera. The Display button toggles detailed settings information about each picture on and off, such as the ISO rating and aperture/shutter speed, and there is a small histogram available during both shooting and playback. The White Saturation display mode during image playback indicates over-exposed highlights by flashing those areas on and off. When taking a photo, pressing the Display button toggles between the no information at all, detailed information, detailed information with a small brightness histogram, and gridlines to aid composition. In summary, the Ricoh GX200 remains a unique, highly-customisable, fast and intuitive compact digital camera that will particuarly appeal to the more experienced photographer. PhotographyBLOG is a member of the DIWA organisation. Our test results for the Ricoh GX200 have been submitted to DIWA for comparison with test results for different samples of the same camera model supplied by other DIWA member sites.